Weil’s behavior is observed by the alluring Roberta Durán (Lena Olin), who recognizes a potential mercenary that will assist her husband’s revolutionary activity for a fee… and a Casablanca-inspired plot ensues as Weil’s cynical exterior is gently broken down out of romantic feelings for a woman already married to a passionate, dedicated fighter. 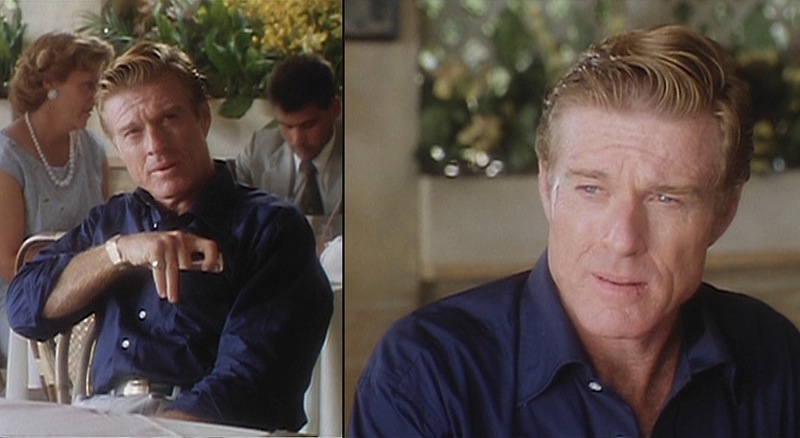 Robert Redford’s look in Havana was developed by the director’s brother, Bernie Pollack, a costume designer whose work with Redford stretches back to the early ’70s when Bernie was an uncredited costumer in films like The Candidate, The Sting, The Way We Were, The Great Waldo Pepper, and Three Days of the Condor. All the President’s Men was one of the first films where Bernie Pollack was credited on the costume design team, and he has since developed his resume as a trusted costumer of major stars like both Redford and Harrison Ford. Jack Weil decks himself out for the passage to Havana in primarily blue and gray. The highlight of his ensemble is a dark navy dupioni silk sportcoat, custom made for Redford by the Western Costume Company. Call me an old romantic, but Jack’s slubby dupioni silk jacket seems to shine the most when he is talking to Bobby. The silk sportcoat is fit very stylishly for the late 1950s with wide, padded shoulders with roped sleeveheads, a darted front, and ventless back. The single-breasted jacket has a two-button front with matching 3-button “kissing” cuffs at the end of each sleeve. All three external pockets are patches: one breast pocket and two larger hip pockets. Jack checks out the hip bathroom scene on the Miami-Havana ferry. Weil wears a richly-colored navy dress shirt with a tag by Nat Wise of London (now Anto). Rakish gambler that he is, Weil almost always wears the long-pointed collar unbuttoned with his tie loosened to some degree. The placket down the front has large white plastic buttons that match the single button on each slightly rounded cuff (and the slightly smaller button that closes the gauntlet further up the wrist). The top of the placket is squared off at the collar. Weil often keeps his pack of unfiltered Pall Mall cigarettes in the shirt’s breast pocket. Jack reflects during his last morning in Havana. For the Christmas Eve party and subsequent visit to Joe Volpi’s casino, Weil wears a boldly-printed silk tie that evokes the Art Deco era and ties in both predominant colors of his outfit. The tie is split down the middle with a navy ground on the right and a silver ground on the left. The silver creeps into the navy half in the form of a branch-like series of lines down the tie, almost resembling amoeba; the silver-grounded left side is split by a bubbled column of alternating navy and silver dots. Cynicism sets in hard during a visit to Joe Volpi’s casino. After the revolution, Weil leaves Havana and sees Bobby for the last time. With no Christmas party to attend and nothing to celebrate, he wears the same outfit but ditches the tie. Jack wears a pair of comfortable and fully-cut light gray trousers made from a soft material that suggests silk or a silk blend. 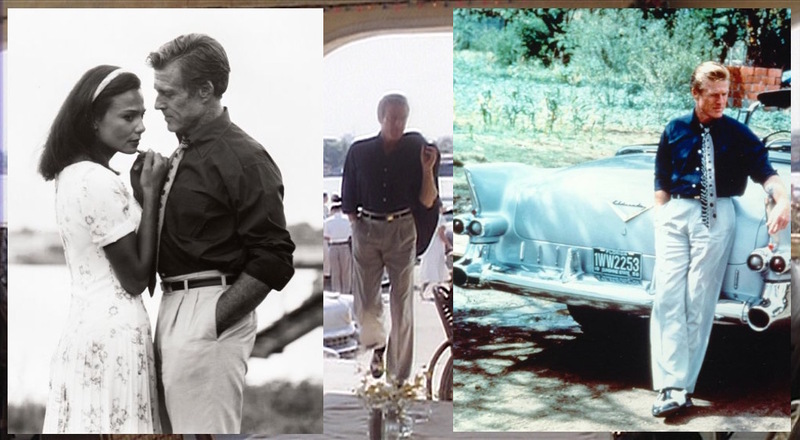 They have belt loops, double reverse pleats, button-through jetted back pockets, and straight side pockets where Redford almost always keeps at least one of his hands. The bottoms are finished with cuffs (or turn-ups) with a medium break over his shoes. Weil’s trousers are best seen as he struts into the open-air restaurant on his last morning in town as well as in some production photos featuring both Lena Olin and a sharp ’55 Cadillac convertible. Jack’s slim black leather belt has a small, closed gold rectangular buckle. 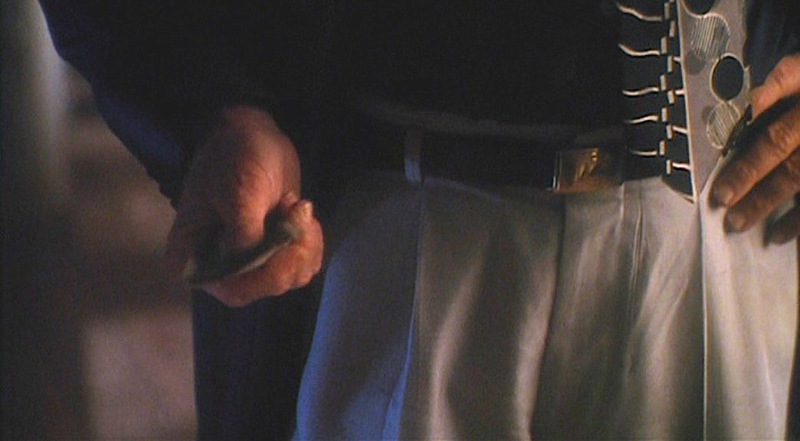 Jack reaches for his handy bribe money after taking the blame for some on-ship contraband. Jack Weil’s two-tone leather “spectator shoes” are the major visual introduction to the character. His black-and-white wingtip brogues immediately signify to the audience that this is a guy who takes pride in his appearance and knows the impression that his clothes make for him. They are 5-eyelet balmorals (or oxfords) with a black perforated toe cap, black outside counter on the heel, black eyelet tabs, and black laces; the vamp and quarter are all white. 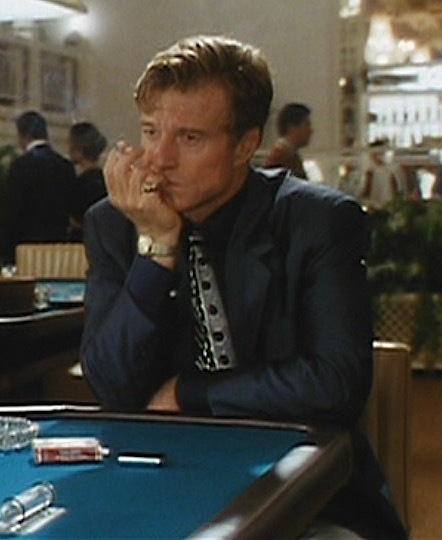 The shoes are featured with another outfit, a turquoise blue suit that Redford wore in the film, at The Golden Closet. 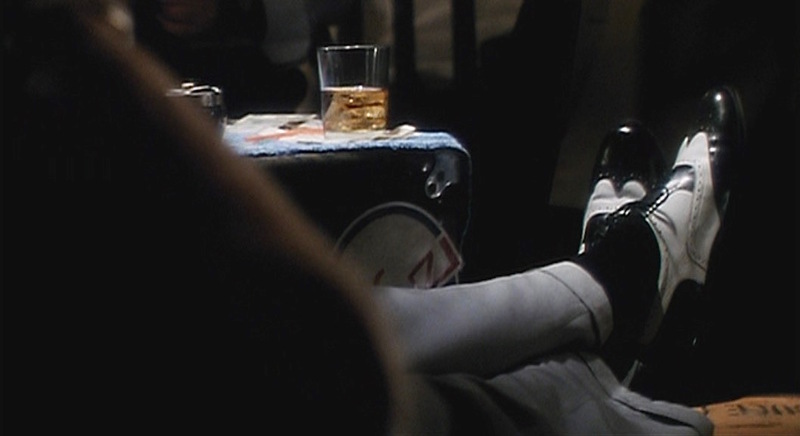 In this scene, he wears them with black socks. Jack’s shoes are the first thing we see, but just from seeing those, we can tell he’s no schlub. On his right wrist, Jack wears a gold watch with a round case, gold dial, and flat gold bracelet. He also wears what appears to be an ornate gold signet ring on his right pinky. This is one of the few times that Redford isn’t wearing the silver ring that he describes as a real-life gift from Hopi Indians in the 1960s. 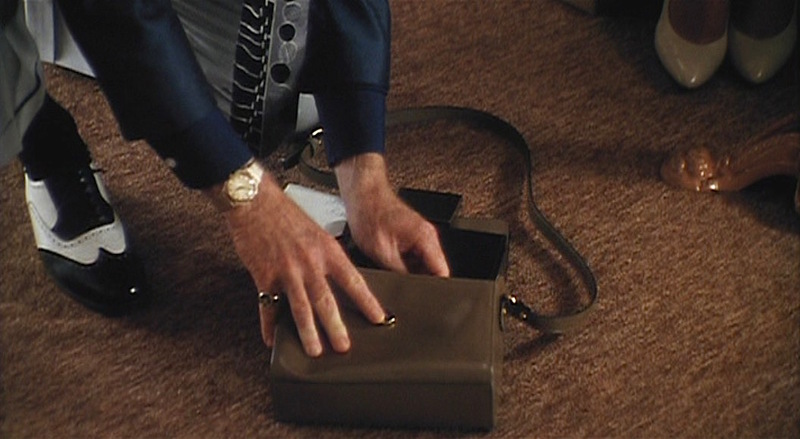 Jack bends down to put Bobby’s Regalias cigarettes back in her purse, flashing his gold jewelry as he does. This original costume was worn by Robert Redford as “Jack Weil” in Sydney Pollack’s epic Havana. The outfit includes a dark blue sport jacket, dark blue dress shirt, black belt, a pair of brown two-tone wing tip shoes and khaki pants. 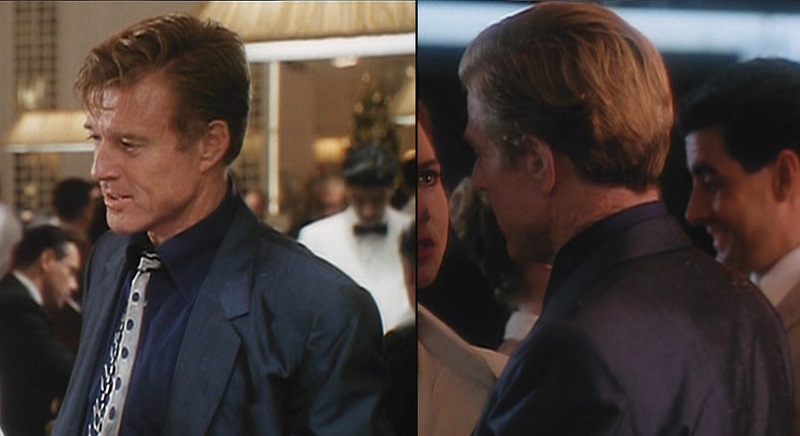 Redford wore this ensemble in several scenes, most notably during a rendezvous with “Roberta Duran” (Lena Olin). The outfit is also seen at a restaurant when “Jack” is preparing to depart Cuba for the United States. The suit was custom-made for Mr. Redford and bears the original Western Costume Company internal labels with “Robert Redford” and sizing information. 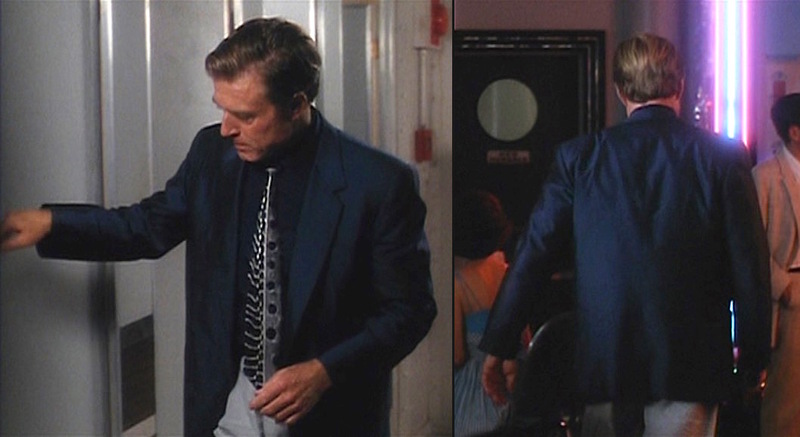 The blue dress shirt was made by “Nat Wise of London” and includes the actor’s initials “RR” and the production date “January 1990.” Director Sydney Pollack’s brother Bernie Pollack designed the costumes for Havana. The auctioned outfit, which includes “a pair of brown two-tone wing tip shoes and khaki pants” featured in other scenes, can be found on page 280 of the Profiles in History catalog. It is item #755 and featured on the same page as a dress worn by Jennifer Connolly in The Rocketeer and the distinctive Hammerli 280 pistol used by Bridget Fonda in Point of No Return. 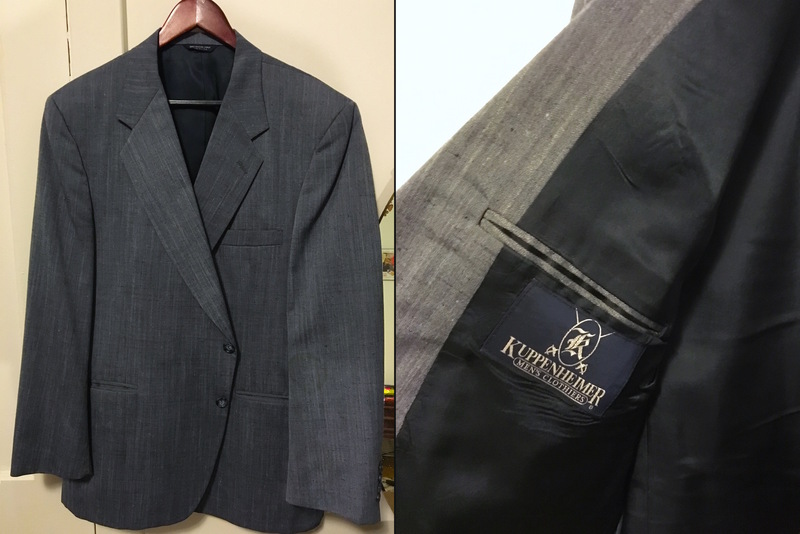 A few years ago, during one of my frequent thrift store shopping outings, I discovered a great blue silk blend jacket from Kuppenheimer, a venerated men’s fashion house that went bankrupt in 1997 after more than 140 years in business and had once been the preferred costumer by Rod Serling. I’m not sure of the age – I would guess it’s from sometime in the early ’90s based on styling and labels – but it is always a popular option when I want to liven up my attire for a night out. My lucky find: a Kuppenheimer blue silk blend jacket. Delicious Cuban cocktails abound in Havana, beginning with the refreshing-looking Daiquiri that Jack Weil orders when he and Bobby reunite in Joe Volpi’s casino on Christmas afternoon. Sipping on an admittedly pleasantly-garnished ginger ale, Bobby must have been rather jealous of Jack’s refreshing daiquiri. A favorite of many from Ernest Hemingway to John F. Kennedy, the Daiquiri was supposedly invented by an American in Cuba around the time of the Spanish-American War. Most credit is given to Jennings Cox, an expatriate mining engineer working in Cuba who ran out of gin while entertaining guests. Adding sugar and lime juice to sweeten the drink to meet his genteel guests’ tastes, the Daiquiri was born. Although it was brought to the U.S. via Rear Admiral Lucius W. Johnson at Washington D.C.’s Army and Navy Club in 1909, it wasn’t until World War II when the drink caught on for Americans. With whiskey harder to come by due to wartime rationing and FDR’s Pan-American program popularizing Latin American culture, rum-based drinks like the Daiquiri began the enduring popularity that lasted decades after the war through the rise of Tiki culture in the ’50s and ’60s. 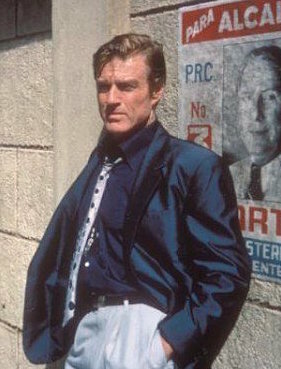 As Jack Weil in Havana, Robert Redford wears a stylish and luxurious blend of blue and gray silk that certainly would have indicated his celebrity status in 1958 Cuba. I can be suave, believe me. There are some great production photos of Robert Redford (and Lena Olin!) while he is wearing this outfit on set, but watermarks prevented me from being able to use them on this page. Check them out at Alamy.com! Jack Weil also often enjoys a shot of añejo with his morning coffee, which also serves as his parting drink before he leaves Havana for the last time. 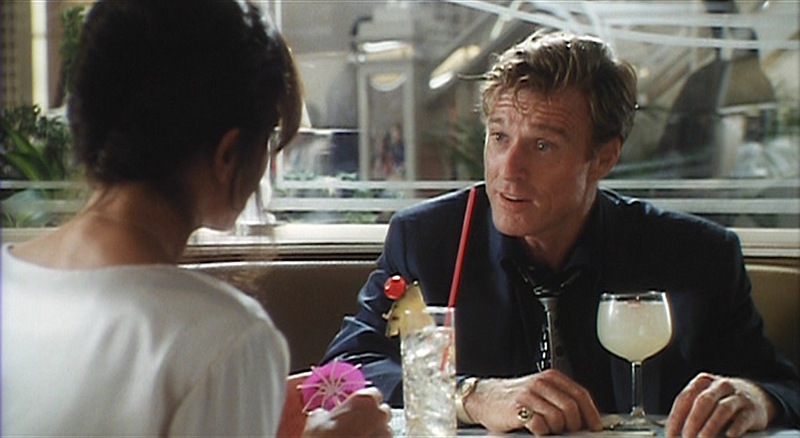 One of the biggest criticisms of the film at the time of release was the fact that Robert Redford was ageing. Which was very unfair, he looks great in the film, at age 53. I was very fit looking, had that great head of hair. OK, he was getting a little weathered and a bit more rugged looking. But I think people thought he was never going to age, like he was superhuman. The costumes were spot on and perfectly capture the late 1950’s. 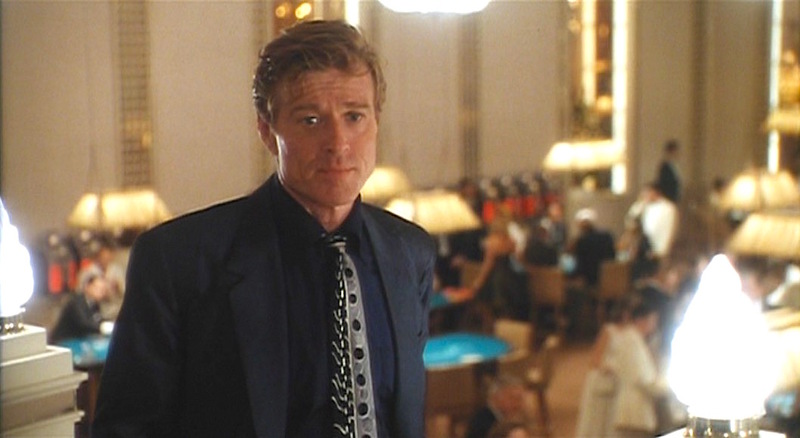 I think Redford had never wore such good looking clothes, even when compared to the costumes from The Great Gatsby. One of my favorite movies! For me, nothing beats the style of Miami/Cuba in the late 50s early 60s. I often run a movie marathon of Havana, The Lost City, and Cuba in between my regular repeated viewings of Magic City.